The Micro TruWireless Earbuds & Powercase is a great promotional item to take advantage of the move to “no wires” being advanced by Apple and others in the consumer electronics market. Unlike may wireless earbuds, the Micro TruWireless Earbuds & Powercase does provide a large imprint area for your brand marketing, directly on the case/charger itself. 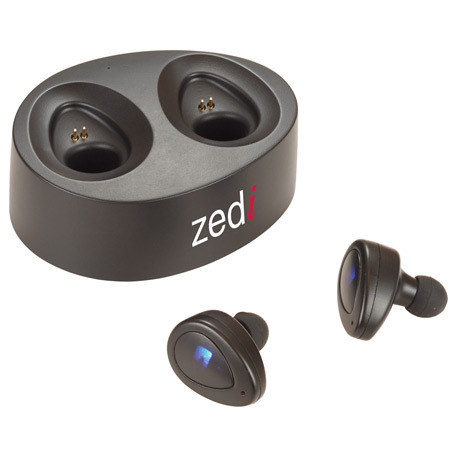 The Micro TruWireless Earbuds & Powercase can take a full color imprint of up to 0.75″ H x 1.75″ W on the charging dock. These are a great executive perk item, or VIP client gift. Please contact us at info@proformagreen.com if you would like more information on – or samples of – Micro TruWireless Earbuds & Powercase.